At Carlton Care Home we are dual registered for both Nursing and Residential clients. 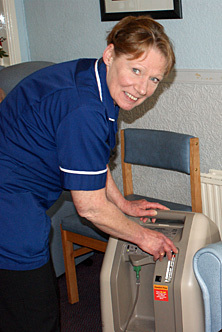 We offer 24 hour nursing care by skilled and dedicated staff. We work closely with external professionals in meeting individual care needs. We have a large number of GP's who are happy to visit the home. We also work closely with the Macmillan team, physiotherapists and occupational therapists where recommended. Other visiting professionals are the optician, dentist, chiropody, nutritional advisors, salt team, district nurses, mobility team and an alternative therapist who visits weekly providing massage and reflexology if required.